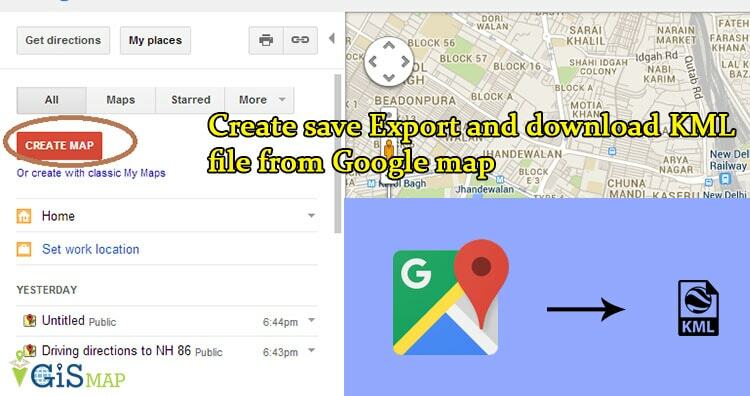 Create save Export and download KML file from Google map. Google map or Google Earth makes use of KML or keyhole markup language, to display features, which actually stores geographic features in Vector format. You can create KML file from Google map for mapping and displaying the same by again uploading the same KML file on Google map or created KML file converted from Shapefile. 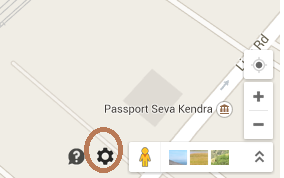 Before creating KML file on Google map, you should have an Google account and should be logged in wtih that. So that once KML file created, you would be able to see it in My Places of Google map after wards. You can also look link for how to create KML file from Google earth. Note: Google provides Google map and this kind of service for free. But i suppose, if you are going to extract and create KML file with your program in bulk, then Google may notify you for the same. 1.) 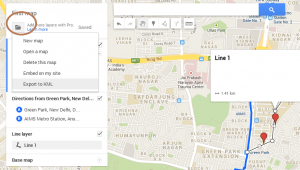 Open Google map and sign in with all in one Google account. 2.) 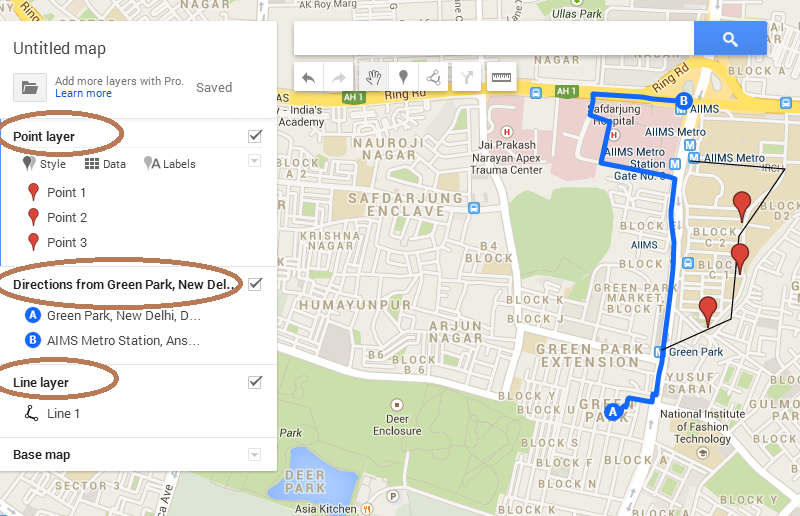 Click the setting button which appears at the bottom right corner of map as shown below (New Google map), and select My places. Or if you are using old map theme, then choose my places from top right corner. 3.) 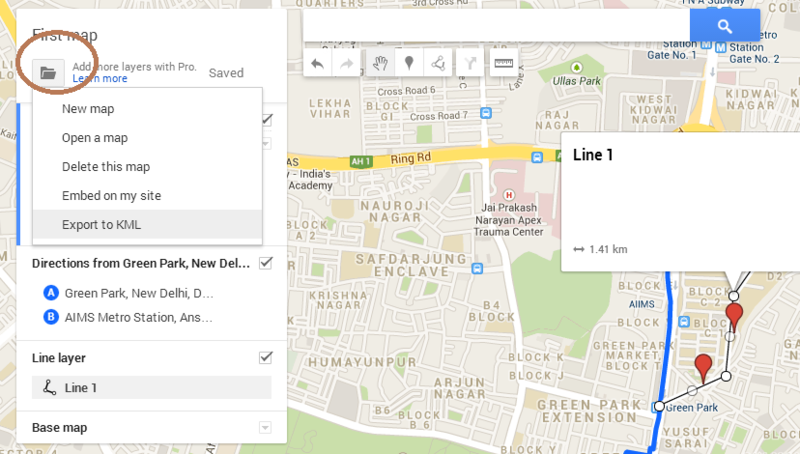 Now click on Create Map, which will open new link in new tab and select Create Map again. you can have different layer. Note: You cannot have more than 3 layers for the same map project for Free. You need to go for Google map pro. Here is the look, i had created 3 layers, i.e 1st one is Point layer, 2nd is Direction layer and 3rd is Line layer, as shown above. 6.) Once you are done with creating map, click the folder icon, shown just below your title of map project and Select Export as KML. Now you can export the entire map or either of the layer by selecting the options. Done. You can now share your map you created map and can also embed it in your website. What are your plannings with the newly created KML file? Do you want to convert kml file to shapefile. Do comment below, how you use KML file so that me as well as our visitors will come to know about new technology and uses. Your valuable suggestion and questions are always welcomed by commenting below in the section provided. Simple interface, no installation needed, all you have to do is upload files and get fasr results. This must be for an old version of Google Maps. That setting icon is no longer there. Yup, same here. The settings gear is gone. Yes the settings icon is no longer available, but still you can go to “Google My Maps” and do all the things mentioned above. Either you can search the whole term or can go the link: https://www.google.com/maps/d/u/0/. Thank you Bikram for the information. I would update this article again. But I can’t figure out from this how to selectively save information (in this case provincial boundaries within a country, which I can see on google maps) as kml file so I can import it to a GIS. How to do that? we have a district map on Google map and i have a shape file of the district but now some how the boundary of the district has been changed which google map is showing right now. so hoe to get that google map corrected district boundry on the google earth. Hoping for swift revert.